Holes in tonsils: what are they and how to get rid of them? Why do you get holes in tonsils? How to treat holes in tonsils? Prevention of holes in tonsils? Here is a detailed, evidence-based article on causes, symptoms and treatment options for holes in tonsils, including risk factors and differential diagnosis. Adenoid is a single tonsil located on the roof of your pharynx. It tends to grow big in childhood, and when you grow up, it becomes smaller and virtually invisible. When pharyngeal tonsils get too large, they may cause snoring and chronic respiratory disorders. This is why some people need surgery (adenoidectomy) to get them removed. Everyone has two tubal tonsils, one at each opening of the Eustachian tube, on the wall of the nasopharynx. You will not be able to see your tubal tonsils as they are hidden deep at the lateral back side of your oral cavity. These are the tonsils, in which you may see some holes, as a symptom of various disorders and issues described below. You may find these tonsils at the back of your throat, in a so-called tonsillar crypt, one on the right and one on the left. Palatine tonsils get inflamed (tonsillitis) and their shape and appearance change (become swollen, have holes inside either clear or filled with white stuff, pus or stones). If you keep getting a sore throat, strep infections, and other respiratory disorders very often or repeatedly, you may get your palatine tonsils removed by a surgery called tonsillectomy. As the name suggests, these tonsils are located at the root of your tongue, one on each side. Again, they do not usually cause trouble, and you cannot find and see them in your mouth when you try to examine your tonsils in front of a mirror. All these four groups of tonsils (adenoids or pharyngeal tonsils, tubal tonsils, palatine tonsils, and lingual tonsils) form Waldeyer's tonsillar ring, which has some important immune function. All tonsils consist of lymphatic tissue (mainly of T-lymphocytes, blood cells responsible for immune response to microbial infections and irritation). Therefore tonsils are "security guards" preventing penetration of harmful bacteria, viruses and other microbes deep into your lungs and gut. As the primary immune response is inflammation, tonsils get inflamed and become painful when they fight harmful germs. This inflammatory response is one of the leading causes of holes in tonsils. Thesummary: Tonsils are a critical part of your immune system and protect your body from harmful microbial infections. There are four types of tonsils (lingual, palatine, tubal and pharyngeal). You will only be able to see holes, blisters and other changes on your palatine tonsils as the other three tonsils are hidden under other tissues and not usually visible. You should know that having holes in your tonsils is very common and nearly everyone has some. There are several different processes involved in tonsil hole formation. As you know, tonsils are an essential part of the immune response to harmful germs and protect your body from external infection. Tonsils consist of cells, which attack bacteria and viruses by "ingesting" them using a process called phagocytosis. After the cell engulfs the microbe (or any other harmful solid particle), it dies, leaving a tiny hole in your tonsils. Tonsils have millions of phagocytic cells and need to "eat" lots of microbes to protect the body from respiratory and other infections. When millions of these phagocytic cells die, they may create holes in your tonsils, visible by naked eyes. The above-described process is called inflammation, and it is one of the most common causes of holes in your tonsils (2). You probably know that when you cut your skin deep enough your body heals the wound by a scar. However, a scar does not consist of the same cells as the original tissue. It is made of fibers (cells called fibroblasts) and looks a bit different than healthy cells. And not only scars look different than a healthy tissue but they also "deform" the healthy cells. The scarred tissue may form holes in your tonsils. Tonsil scarring is not the same as the scar you may have after surgical removal of tonsils. If you have your tonsils removed, you are at no risk of having holes in tonsils (e.g., no tonsils = no holes). Inflammation and scarring make holes in your tonsils. Sometimes these holes are just holes with no deposits or secretion (e.g., a sore throat caused by viral respiratory infection). However, in the case of bacterial infection of your tonsils (bacterial tonsillopharyngitis) or complications (such as parapharyngeal or peritonsillar abscess), holes in your tonsils may be filled with pus (2, 3). Pus is "white or yellow stuff," which is made by some pyogenic (pus-forming) bacteria, such as GAS (group A streptococcus), which is one of the leading cause of bacterial tonsillopharyngitis. Pus formation is also typical for mononucleosis and diphtheria (4, 5). Sometimes, holes in tonsils may get filled with different materials (such as food, cellular debris, etc.). This stuff gets stuck in the hole or tonsillar crypt, and harmful germs in your mouth may turn it into tonsil stones (tonsilloliths) through the process of calcification. In addition to calcium, tonsil stones usually contain phosphorus, magnesium, ammonia and carbonate. The summary: The inflammation and scarification are the typical processes involved in the development of holes in tonsils. Sometimes tonsil holes are filled with pus (produced by bacteria) or tonsil stones. 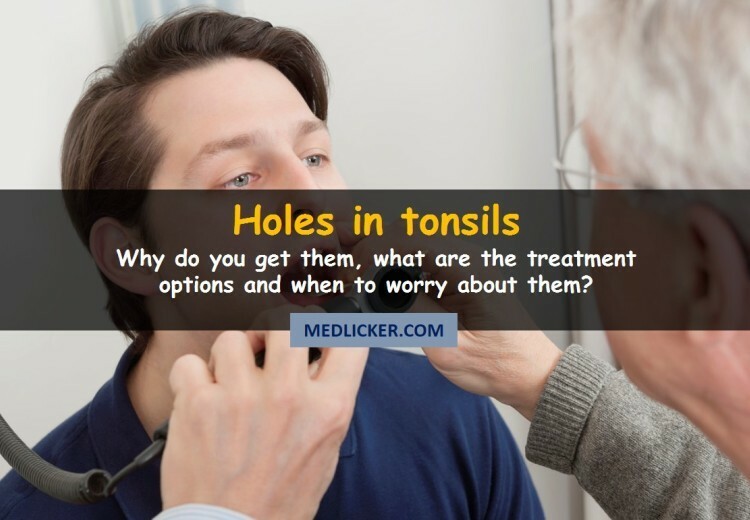 You should know that there is no medical disease called "holes in tonsils." They are only symptoms of various disorders, some of which are harmless and others are severe. Therefore, you must always see a physician if you see holes, blisters, pus or stones in your tonsils, as the proper medical examination is required to rule out some serious issues. These are some of the disorders frequently associated with holes in tonsils. Group A streptococcus is a bacteria, which causes acute tonsillitis. There are several types of GAS, and the most virulent one is Streptococcus pyogenes (6, 7). This bacteria causes acute inflammation of tonsils, which is accompanied by fever, sore throat, and painful swallowing (8). Acute tonsillitis caused by GAS usually requires antibiotic treatment and is associated with the formation of a yellow or white coating on your tonsils. Tonsils may also get swollen with holes or blisters. Here is a picture showing tonsil holes filled with pus caused by group A streptococcus. A sore throat and holes in tonsils are also symptoms of viral respiratory infection. Unlike the GAS infection, there is usually no pus or white coating on your tonsils in the case of viral tonsillitis. You may develop holes or blisters in tonsils. Also, your fever tends to be lower than in the event of group A streptococcus tonsillitis. Antibiotics are useless in the treatment of viral tonsillitis, so the only possible management is to drink lots of tea, eat enough vitamins and take medication to lower your temperature (antipyretic drugs such as Ibuprofen or Paracetamol) (8). Holes in tonsils may be one of the symptoms of oral cancer. This type of cancer affects your throat (a part of it called oropharynx) (9). In addition to tonsils, the cancerous cells may grow on your tongue, soft palate (far back section of your mouth roof). Tonsil cancer has been associated with HPV (human papillomavirus) infection, in particular, the HPV16 type. Smokers are also more at risk of getting holes in tonsils as a result of oropharyngeal cancer (9). If you see any holes, blisters or nodules on your tonsils or in surrounding areas, or if you have difficulty to swallow or speak (e.g., if there is an unexpected change in your voice), see your physician immediately and ask for a proper examination. Most of the time everything will be all right, but some tests must be made fast to rule out cancer. The cause of mononucleosis (also called "mono" in short) is EBV (Epstein-Barr virus). It is a severe disease, beginning with symptoms like a sore throat (often associated with foul-smelling breath), headache and fatigue (10). Your tonsils are usually affected as well. You may see some holes in your tonsils, with white to yellow coating or spots (10). Your neck lymph nodes may be swollen and painful. Medical treatment is required, and you should see your doctor immediately if you develop any of the symptoms above. Fatigue, white to yellow coated holes in your tonsils and foul-smelling breath are the most common symptoms of mononucleosis and require immediate medical attention. Smoking (including vaping or electronic cigarette smoking) has numerous health hazards and is also directly associated with holes in tonsils as it increases the risk of tonsil stones (also called throat nuts or tonsilloliths). Cigarette and tobacco smoke contain thousands of gasses and molecules, which affect your health in many ways. When you smoke your respiratory tract gets damaged over time, and its self-cleaning function becomes impaired, which may promote overgrowth of harmful bacteria and fungi in your mouth. When you have some holes in your tonsils (due to previous inflammation, disease or as a result of scarring), debris of food or dead cells may get trapped in these holes, and harmful bacteria in combination with cigarette smoke may turn the trash into stones (through the process called calcification). Tonsil stones may be tiny, but sometimes they may become enormous. In addition to calcium, they are also rich in other minerals, such as magnesium and phosphorus. Symptoms of tonsil stones include halitosis (bad breath), feeling of pain while swallowing and recurrent severe episodes of tonsil infection (tonsillitis). You may also sense a foreign body at the back of your throat and have a metallic taste in your mouth (11). This is how a tonsil stone looks. Sometimes you may have no symptoms at all and still have a large tonsillolith in your throat. If you do not clean your teeth and mouth regularly, you also take a higher risk of tonsil stone development as plaque forming bacteria are the ones, which turn the small food debris trapped in your tonsils into throat nuts. If you see anything suspicious on your tonsils or in surrounding areas, get an appointment with your physician as soon as possible. As you already know, "holes in tonsils" is not a medical disorder, but rather a symptom of various diseases. Therefore it is always necessary to get an appointment with your doctor to diagnose the problem and recommend appropriate treatment options. Treatment options for holes in tonsils depend on the underlying disease. If there is no discharge or pus (e.g., regular tonsil holes), the management will be entirely different than in the case of pus or stone filled holes in tonsils. GSA (mainly streptococcus pyogenes) is one of the most common causes of bacterial tonsillopharyngitis (inflammation of tonsils and pharynx). One of the symptoms of GSA infection are holes in tonsils, usually filled with pus. Other symptoms are fever (over 38°C or 100.4°F), sore throat, difficulty in swallowing, etc. Group A streptococcus infection may cause some life-threatening complications, so even a "mild" throat infection or pharyngitis must be appropriately managed to avoid fatal STSS (Streptococcal Toxic-Shock Syndrome) and other severe disorders, such as rheumatic fever or post-streptococcal glomerulonephritis (severe impairment of kidney functions). You may also need to take some analgesic and antipyretic drugs to manage fever (acetaminophen or NSAIDs). And you should also have a rest, stay in bed, drink enough fluids to prevent dehydration. Viral pharyngitis (or tonsillopharyngitis) is caused by various groups of viruses, including rhinovirus, adenovirus, EBV (Epstein-Barr) virus (the causative agent of mononucleosis - see below), HSV (herpes simplex virus), influenza virus, parainfluenza virus, coronavirus, respiratory syncytial virus (RSV), CMV (cytomegalovirus) and human immunodeficiency virus. Symptoms of viral tonsillopharyngitis include a sore throat, holes in tonsils (usually without pus but in the case of mononucleosis, you may have some white or yellow spots on your tonsils and foul-smelling halitosis) and fever (generally lower than 38°C or 100.4°F). There is no specific treatment for holes in tonsils caused by viral pharyngitis, but some people may benefit from salt water gargles (one teaspoon of salt in a glass of lukewarm water). Acetaminophen or NSAIDs are recommended for fever control (13). If you have holes in tonsils due to oral cancer, these would probably present as non-painful blisters or holes in tonsils. If you see anything suspicious on your tonsils or in your mouth, you should always get a medical appointment as soon as possible. Smokers are more at risk when it comes to oral cancer development, but this disorder may also affect non-smokers and people with healthy living habits. Based on the type of tumors, radiotherapy, chemotherapy, surgery and biological therapy are the standard treatment options (14). The causative agent of mononucleosis is EBV (Ebstein-Barr virus). The symptoms of mononucleosis include fatigue, holes in tonsils with white to yellow spots, swollen lymph nodes and a foul smell from your mouth. Unfortunately, there is no specific treatment for infectious mononucleosis. It is a viral condition and antibiotics are useless. The symptoms of this disease usually disappear in several weeks. You should have a rest, drink plenty of fluids and follow a healthy diet as the disease also affects liver functionality (15). Sometimes, food or cell debris, which fill holes in your tonsils, calcify, which results in tonsil stones. The symptoms of tonsil stones include bad breath, difficulty in swallowing and also ear pain (irritation at the back of your mouth near Eustachian tube may cause ear pain). 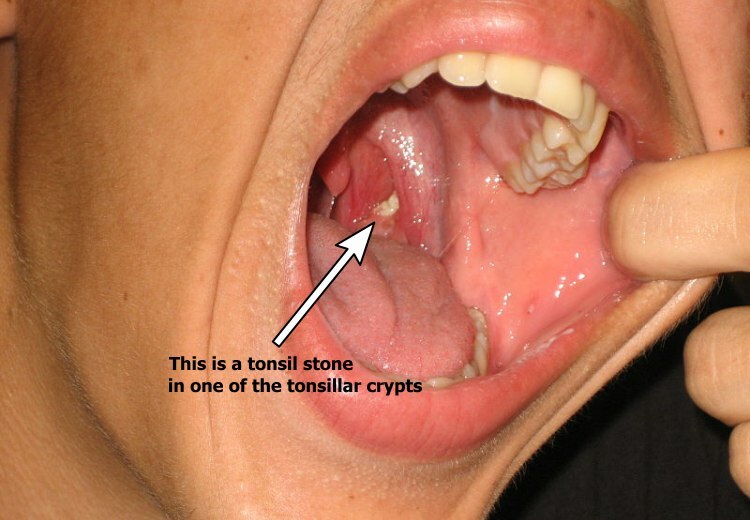 If you have a tonsil stone, you should see your doctor as soon as possible. No treatment: if the stones do not cause any trouble, no special treatment is necessary. Antibiotics: sometimes your doctor may prescribe antibiotics to kill the germs (bacteria) in your mouth, which turn food and cell debris into tonsil stones. Surgical removal: if your tonsil stones become too big, are painful and troublesome, your physician may suggest their surgical removal. Salt water gargle: if you suffer from tonsillitis, which is one of the symptoms of tonsil stones, salt water gargle (one tablespoon of salt diluted in a glass of lukewarm water) may ease the inflammation. Home treatment: some people try to dislodge tonsil stones using a toothpick or cotton swab but we do not recommend it as the throat and the area around tonsils, in particular, is very sensitive and touching the tonsil may result in a cough or vomiting (due to irritation of the vagus and glossopharyngeal nerves). The summary: Treatment of holes in tonsils depends on the underlying disease. You should always get an appointment with your doctor to diagnose the problem and suggest appropriate options for the management of your medical disorder. The best way to prevent holes in tonsils is to prevent diseases, which may cause them. Take proper care of your teeth and oral cavity. Brush your teeth at least twice a day - in the morning and before bed and learn how to brush your teeth correctly. You should brush your teeth, palate, and tongue and use dental floss regularly to get rid of dental plaque, which is full of harmful germs, which may cause holes in tonsils. If you suffer from recurrent tonsillitis (infection and inflammation of tonsils), your doctor may suggest surgical removal of tonsils. Also if you are a smoker, try to stop smoking. "Holes in tonsils" is not a medical disorder but a symptom of various diseases, including strep infection, mononucleosis, cancer (e.g. lymphoma or oral cancer) and tonsil stones. The processes involved in the development of holes in tonsils include inflammation and scarring. Sometimes the holes in tonsils are clear (regular holes in tonsils), while other times they may be filled with pus (bacterial infection) or tonsil stones (calcification). You should seek immediate medical attention if you see any holes, blisters, nodules and similar structures on your tonsils.